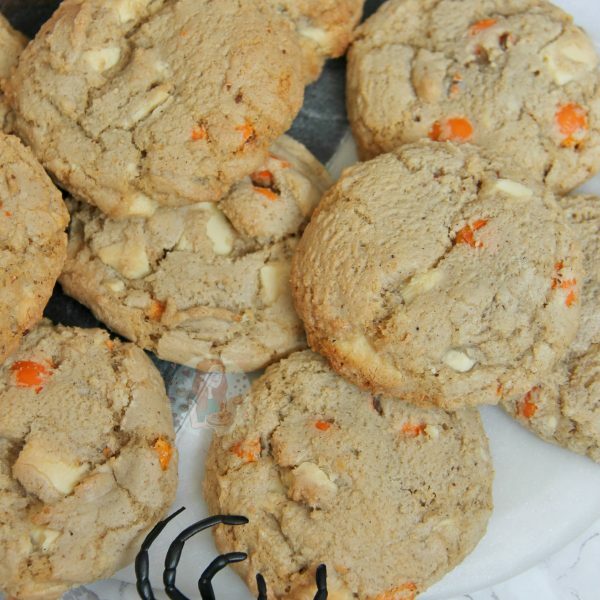 Pumpkin Spice flavoured Cookies with White Chocolate Chips, and some M&Ms – Perfect easy bake for Halloween! 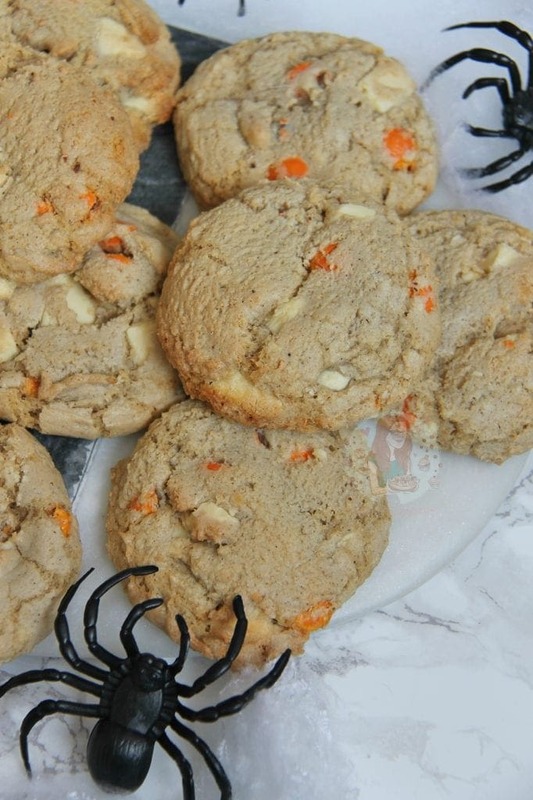 I posted my recipe for my Raspberry and White Chocolate Cookies and I just couldn’t resist making a Halloween version for my blog. 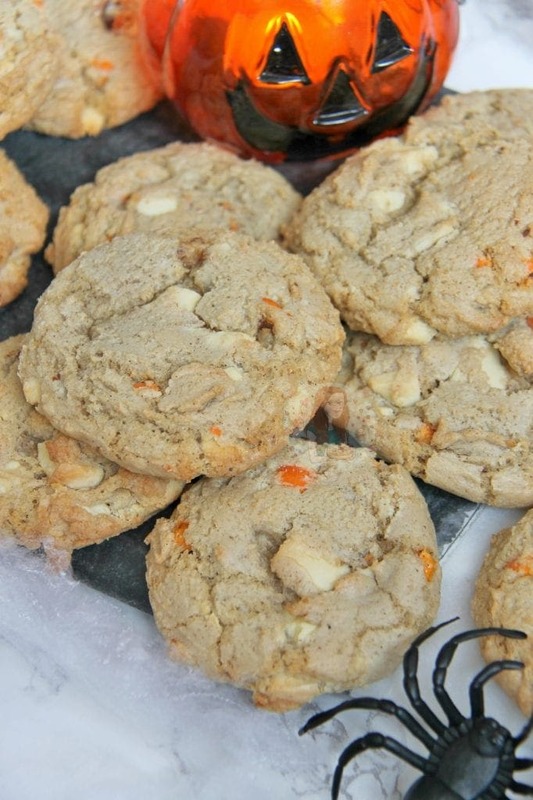 I know the recipe is oh so similar, but c’monnnn… PUMPKIN SPICE COOKIES. 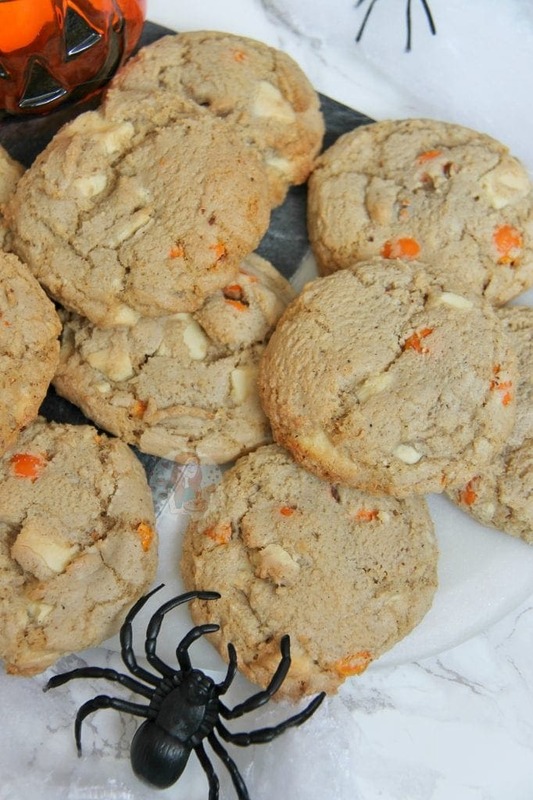 After the success of my No-Bake Pumpkin Spice Cheesecake and my Pumpkin Spice Cupcakes last year, I thought a Cookie version for this year would be perfect. The Pumpkin Spice mix is so very easy to make, and its made up for five different spices. Cinnamon, Ginger, Nutmeg, All Spice, and Cloves. I admit that buying five different spices, to then only use 1-2 tsps of it in one mix, does seem a little much… however, its worth it. Cinnamon, Ginger, and Nutmeg I use on regular occasions, so I only needed to buy the All Spice and Cloves. It’s a mix that you can whisk together, and then keep for ages. Use it in my other Pumpkin Spice recipes, or use it for other bits as well! Pumpkin Spice for me is famous because of the Starbucks Pumpkin Spice Latte. I will admit that I am much much more of a Hot Chocolate gal, but I have tried the PSLs and they aren’t half bad! Some other places also do Pumpkin Spice treats, even Baileys have a Pumpkin Spice version, so its definitely a flavour combination that has become very popular over the past couple of years. Some places I find PS can be quite sweet, like Starbucks, and others its a lot more spicey. Whisk the Plain Flour, Bicarbonate of Soda, Salt, Cornflour and Pumpkin Spice Mix together in a bowl and leave to the side. 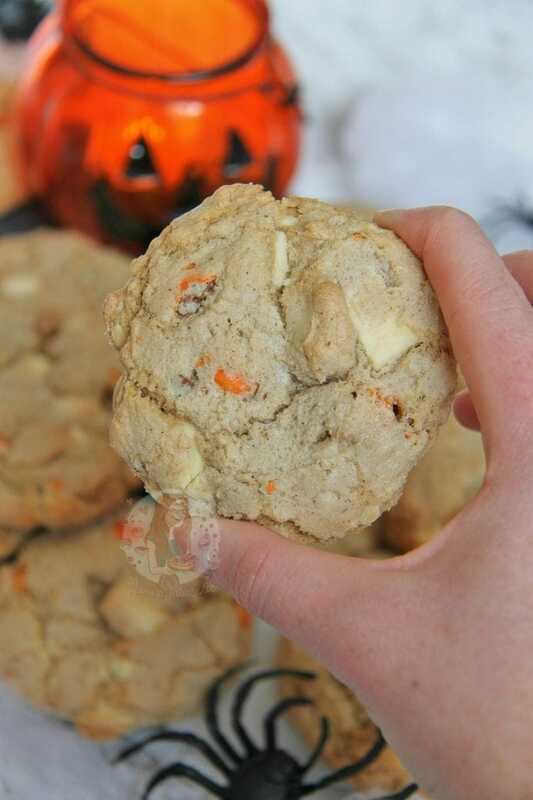 Add in the flour mixture, Chocolate Chips and Orange/Pumpkin/Halloween M&Ms and beat till everything is evenly distributed and a cookie dough is formed. I use this Pumpkin Spice Mix from my recipes. You don’t have to use the Pumpkin Spice Mix if you don’t want to – you can just leave it out, or even just use little less if you’re not sure. 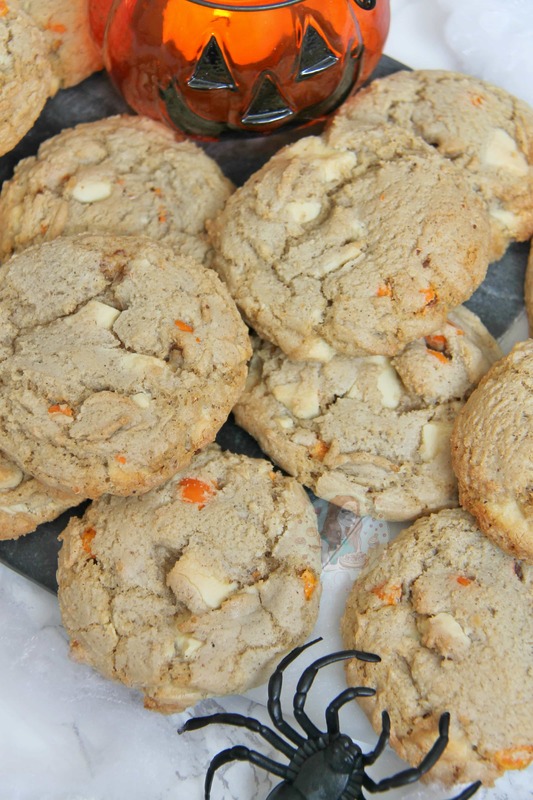 I used Orange M&Ms as when I baked these and photographed them, I had eaten the Pumpkin ones that someone had bought for me. Occasionally M&Ms do ‘special bags’ of Halloween M&Ms so they’d also be good to use. Older Next post: Apple Crumble Cheesecake! Newer Previous post: My 25th Birthday Cake! 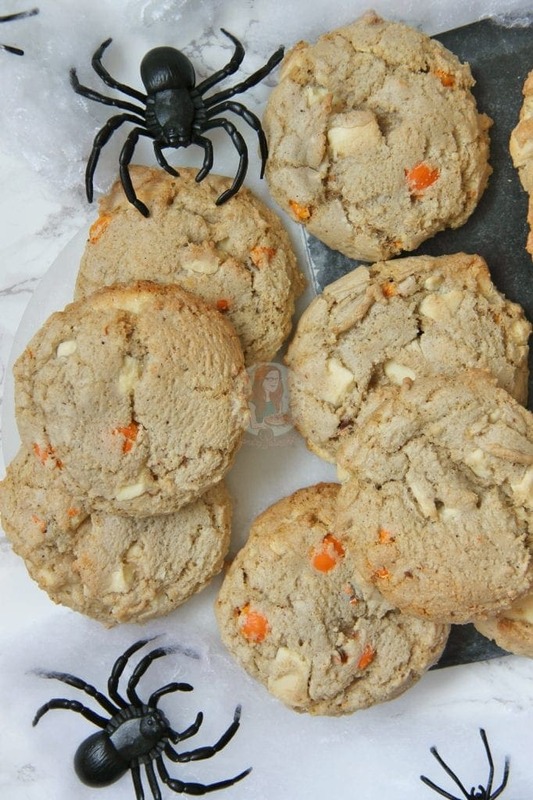 These look amazing Jane! I’m so excited to try the recipe!